BERLIN (Reuters) - German Chancellor Angela Merkel, campaigning for her Christian Democrats (CDU) to retain control of the crucial state of Hesse in next Sunday's election, promised legislation to ward off the threat of air pollution leading to driving bans. 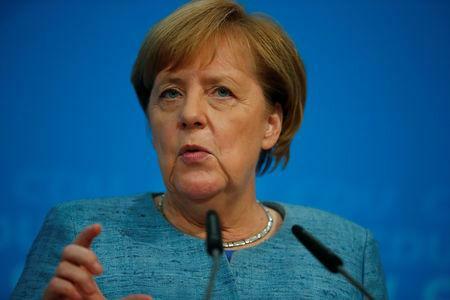 Speaking at a news conference on Sunday evening, Merkel said it would be disproportionate to ban dirty diesel cars from the road in places like Frankfurt, Hesse's largest city, where nitrogen emissions limits were only marginally exceeded. Following her allies' disastrous showing in Bavaria's regional elections last week, Merkel faces murmurs of dissent within her party. Defeat in the state to the resurgent Greens could prove fatal to her premiership. 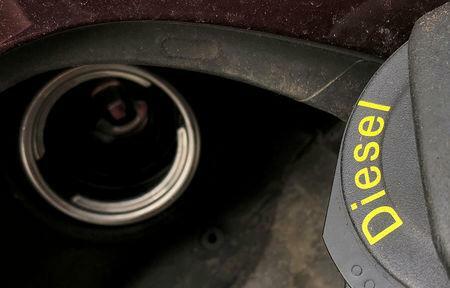 Emissions from diesel cars have pushed nitrogen levels above the permitted level of 50 milligrams per cubic metre in dozens of cities across Germany, and Merkel's government is keen to avoid widldly unpopular bans on taking the cars on the road. "Driving bans are disproportionate when it comes to small excess pollution levels," she said. "We want to change the law ... That is a very important piece of information for a city like Frankfurt." The new legislation would enshrine in law that driving bans were not proportionate in cases of a small excess such as in Frankfurt, where nitrogen levels stand at 57 microgrammes, since deployment of cleaner buses and other measures would be sufficient to rein in pollution levels before 2020. Striking a populist note, she placed herself firmly on the side of consumers when it came to the cost of expensive retrofitting of vehicles that might be needed in cities where excess pollution is substantial. "We are on the side of owners of diesel cars and are clear that they should suffer no financial harm," she said. "We believe the car industry bears responsibility because it has massively undermined trust in it."